M.S. Nachi Maru, c. 1930. M.S. Nachi Maru, in the livery of its original owner, Osaka Shosen K.K. (OSK) Line, c. 1930. From the wiki: “M.S. 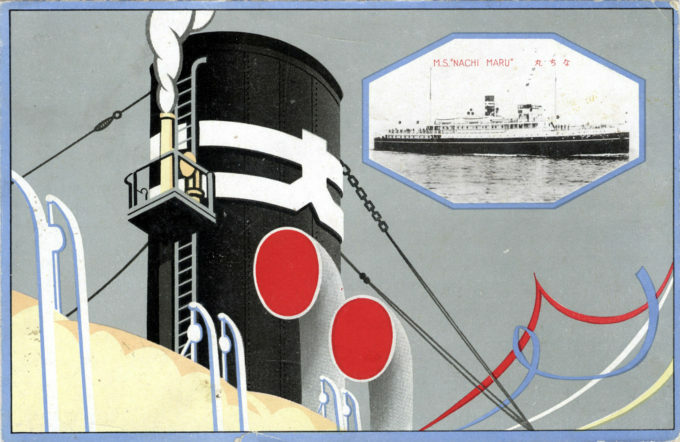 Nachi Maru was launched in 1926 as a 1,605-ton passenger-cargo ship for the Osaka Shosen K.K. (OSK) Line, serving Inland Sea routes most frequently between Kobe and the hot springs resorts at Beppu. “In 1942, the ship was sold to Kansai Kisen K.K., Osaka before being requisitioned by the Imperial Japanese Navy in 1943 for conversion into an auxiliary gun ship. Nachi Maru remained in this role until early 1945 when she was reconverted into an auxiliary submarine depot ship for midget submarines, and assigned to the Tenth Special Attack Force being formed at Kure in March 1945 in anticipation of the Allied invasion of the Home Islands.